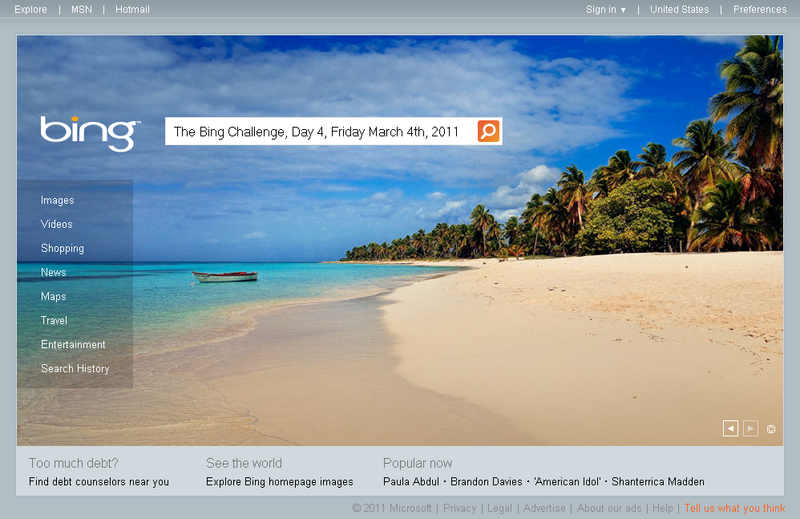 About all the searching I was able to do today was to search Bing for various keywords related my earlier post on the challenge including this one “the bing challenge” site:webranking.com [opens in new window]. I published the post at 9:11 am CST this morning and checked Bing SERPs several times throughout the day and have been unable to find it. As of right now (9:18 pm CST), the URL is not showing in Bing’s SERPs for that site: query. It has been over 12 hours since then. The post has also been Linked to, Tweeted about and Liked on Facebook. However I did find the Search Engine Land daily SearchCap post showing on page 5 for the query “the bing challenge”, which contains the title, a link to my earlier challenge post and is currently marked with a relative time of 4 hours ago. Since SearchEngineLand.com has a fairly high link popularity and publishes new content several times each day, today’s indexing pattern would seem to back up the premise that more popular sites get spidered increased frequently by Bing and will have new content showing in search results sooner. This is not new to me, but it is a notable pattern that still continues. Checked the search query this morning 10:33 am CST for: “the bing challenge” site:webranking.com and still no listing after 25 hours. 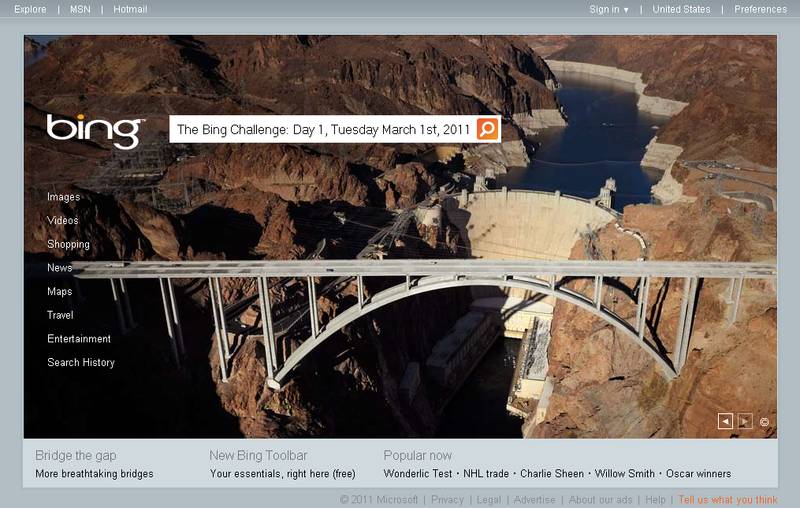 I also checked “the bing challenge” [new window] and it SEL’s SearchCap post from yesterday has dropped our of the results and is no longer showing on the 5th page [new window]. 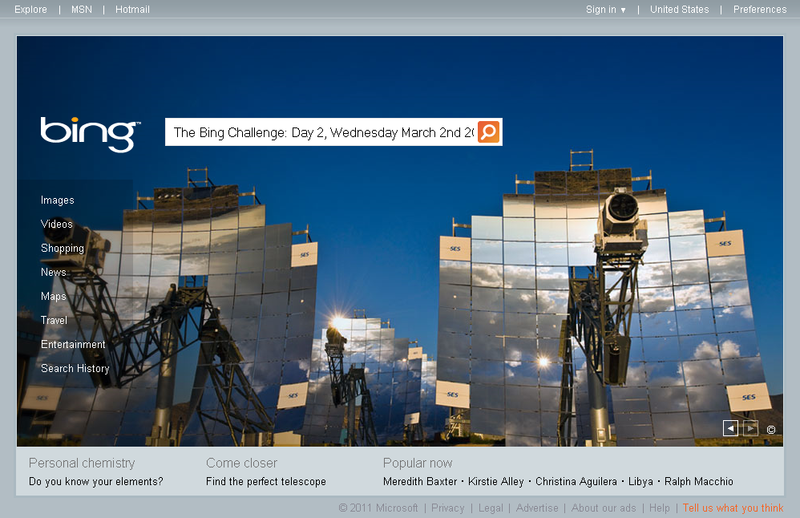 However, when the search is preformed for “the bing challenge” site:searchengineland.com [new window], the SearchCap URL is shown. This would suggest that Bing is carrying a supplemental index of results where they keep viable listings only for select queries. Update: As of 4:24 pm CST this afternoon, the new SEL daily SearchCap for today, that links to this post, is showing in Bing on page 5 for the query “the bing challenge”. I will have to check again tomorrow and see if it bounces to the supplemental index. Sometime between 2 and 4 om this afternoon I found a few minutes to check the “the bing challenge” site:webranking.com query in Bing to see if either of the 2 posts from the past few days had yet made it into the SERPs. Nope. At this point I thought I’d, (wait for it) manually submit a URL to the Bing Submit page and see what happens. I choose the URL for this page just to see if it would get indexed quicker then the older post page. At around 8:30 pm CST, I managed to make it around to checking again to see if either page was showing. Nope. Alright, now I’m starting to wonder a little if we might be experiencing some sort of indexing problem. 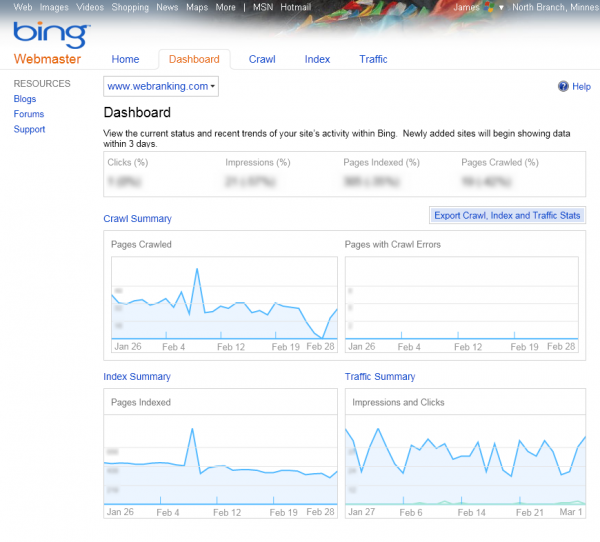 Time to check Bing Webmaster Tools. Initially the Webmaster Tools Dashboard looks good. Pages Crawled, Pages Indexed, and Impressions and Clicks look to be consistent. The Pages with Crawl Errors even is showing Zero across the board. However the data shown in only up to and including the 28th of February, except for the Impressions and Clicks which is showing March 1st. This would hint at a 2 to 3 day lag time in the data that gets displayed. This is also similar to Google Webmaster Tools data delay. Bing Webmaster Tools Dashboard: Pages Crawled, Pages Indexed, Impressions & Clicks, and Pages with Crawl Errors. Next I head over to the Index Summary to see what they have indexed and will tell me about. 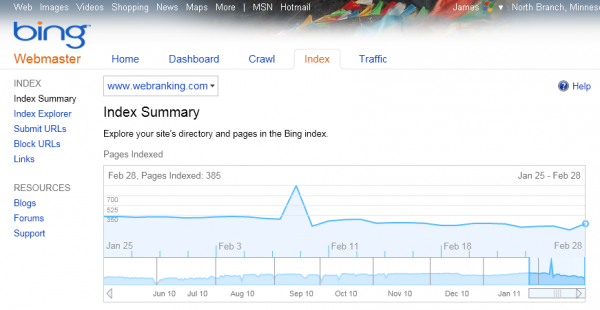 Bing is reporting a consistent range of 305 to 875 indexed pages, with 385 Pages Indexed on Febraury 28th, the last day Bing is reporting in Webmaster Tools. So that rules out my worries about having any indexing issues and it is still looking like Bing devotes more crawler bandwidth to sites with higher popularity. Next I check out the Crawl tab and go to Sitemaps to see if we have any feeds or a sitemap is listed. Nothing has been submitted yet so I take a minute and add our Blog Feed. This should help Bing pick up our new posts quicker from here on. Now that that has been taken care of I head back to the Index tab and go to the Submit URLs page. Instead of waiting on the public submission form to pick up the pages, which may or may not be ignored, I decided to add them here so they have their best chance of being found in a timely manner. An curious feature of the Submit URLs section is the fact that they limit your submissions to only 10 page URLs per day and a total of 50 URLs per month. This area is also unique because Google Webmaster Tools does not have this feature. They have a Sitemaps section that is similar to Bing’s where you can also submit your sitemap or feed, but that is the extent of it. Of course Google is much faster at indexing new content then Bing as I’ve had new posts showing in Google’s Blog Search in as little as 15 minutes before. At around 7:30 pm CST this morning I checked Bing SERPs for the “the bing challenge” site:webranking.com query and there they were. Finally. Key Takeaways: The main takeaway here it to make sure you have all of your website sitemaps and blog feeds listed in Bing Webmaster Tools so that Bing has an easier time finding and indexing your new content. 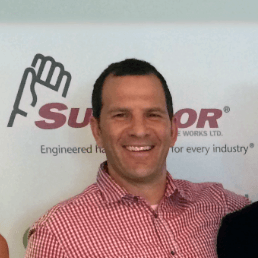 The 2nd takeaway is to use the Submit URLs section in Webmaster Tools if you have new content that is of more importance to you that you want to make sure is indexed. However it is not clear if adding a feed or sitemap is enough to speed things up or if using the Submit URLs was needed in this instance. Because of this I am now running a test this for a new post we just published on Bing Testing an Alternate SERP Format. I will be looking to gauge the length of time this post takes to start showing in the index through discovery via the RSS Feed that was submitted in the Sitemaps section in Webmaster Tools. 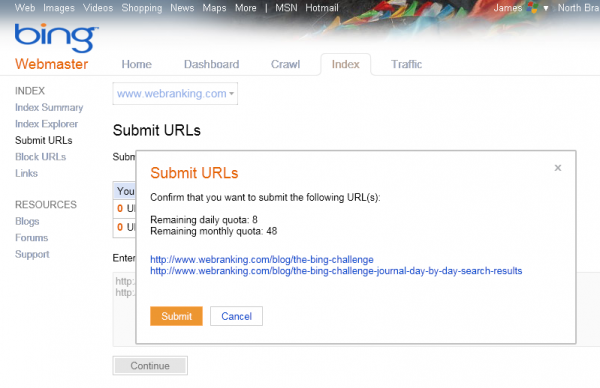 WebRanking Bing Challenge Posts Indexed and Showing in SERPs on the 4th Day. 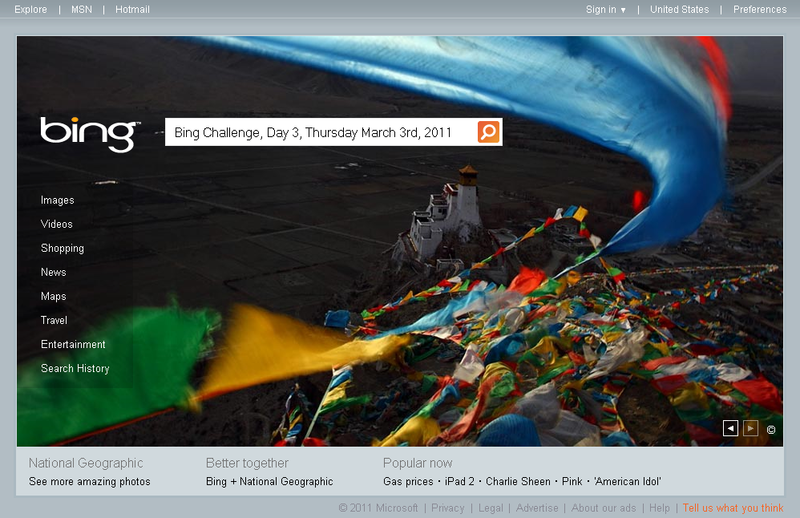 More of the Bing Challenge is covered during Week 2 focusing on Bing’s Search Tools, Features & Options. What do you think of the Day By Day Search Results? Feel free to leave a comment.